Desks and Tables Linky Party! Ok, that title would probably sound strange to anyone but a teacher!!! Right now, my setup is a combination of the two. I have tables up front by the board for the whole group lessons. The desks are in groups, towards the back for more individualized/small group work. This is a terrible picture (from my cellphone last summer) but shows my basic setup in part of the room, though the tables and desks are now reversed. For years, I’ve debated on switching to tables only. It would save so much space, eliminate desk clutter and endless searches for items in the desks, free up space for reading nooks, and so on. Plus, I’m tired of tripping over furniture!! One of my biggest concerns is where to store their items. I have the class pretty trained in using these baskets to keep things neat. But I don’t know where I’d store the baskets without desks. I’m thinking a bookshelf (I have tons of those!). I do like the flexibility tables offer in seating. I thought I could use just a small piece of Velcro to affix and change out name tags (did that on the desks this year and it worked well). I think this year will be when I do finally make the switch, but I’m nervous about it!! (This is as bad as when I got rid of my teacher desk!). My baby sis has a blog! Video Tutorial: Adding a Google Reader button! I LOVE the velcro for the name tags. What a great idea! Did I read somewhere before that you cover your tables in contact paper?? I'm a desk person. I would love to use tables, tables would give us so much more space in the classroom. As it is though, I don't have enough storage for anything in my room, and I like that students have their own space at a desk. When they sit together at tables everything becomes an issue. Like someone else's erasing bits that get pushed onto someone else's paper, and so on. I would certainly love the additional space though. We have 36 1st graders so space is at a premium. We started the year off with just tables. We had containers at the ends of the table for their items. We have also used crates at the end of the tables (2 crates zip tied together)or between 2 tables. 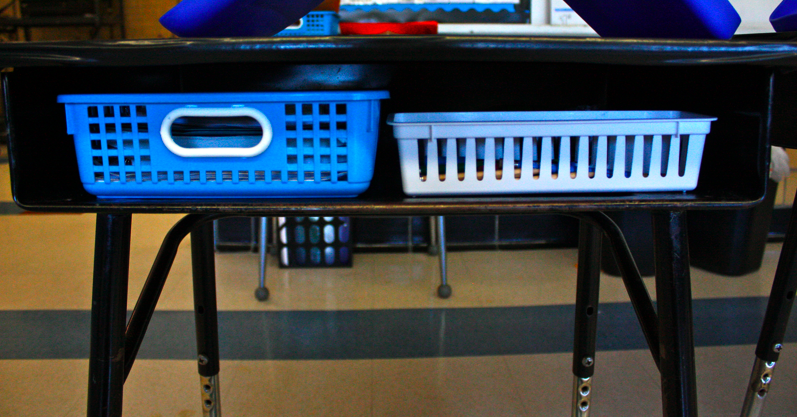 We love tables but struggle with the organization of their things and the lack of being able to separate the students at times. 1/2 way through the year we asked for 15 desks and gave away a couple of our tables. We were able to have both options for awhile. We also did velcro for the name tags. It gave us the flexibility of switching name tags and table spots often. how hard is it to remove the velcro at the end of the year? This is an awesome idea for a linky party!!! I can't wait to get good ideas for setting up my classroom. Also, a class I was in one time had all tables, and the teacher used chair pockets to hold their notebooks and workbooks, and it seemed to work really well! Then she could just move the chairs when she wanted to move seats. They had a communal supplies bin for pencils and things like that. Thanks for the input everyone! This is really helpful, I appreciate you stopping by to comment!! Ashley, I do cover my desks and tables with contact paper…it totally changes the whole look of my room (they're brown otherwise). It also saves me from having to remove the Velcro…I just peel off the entire sheet(s) of contact paper. 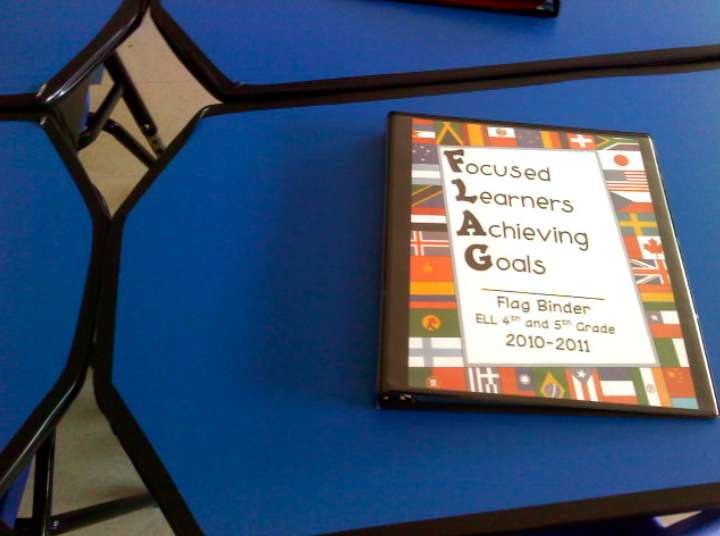 Started the year with desks…moved to trapezoid tables and used aussie pouches http://www.aussiepouch.com/ to store personal 'stuff'. This next year I'm getting chair shelves (http://www.reallygoodstuff.com/product/store+more+chair+shelf.do?sortby=ourPicks&from=Search) to store text books — I teach 4th grade. For pencils, etc. students have their own pencil box. I was always a desk girl but when I moved to my current small space I had no choice but to switch to table and I LOVE it! However I still see the value of desks. Three things I learned today from you…. 1. Contact paper makes the desks look amazing! 2. Velcro…what a simple idea, I love it so much more that rows of packing tape! 3. You still have a few more weeks left? Heavens!! We have 2 days and a half day! Yippee! Thanks for such a great post! I can't link up 'cause I have no pictures and my co-teacher has the desks are cleaned and put to one side for the summer! Where do you get your contact paper?? I love the idea! I have desks in my room but next year will be going from 19 students to 25ish. I am thinking that table might be a better option. So are you using blue and black contact paper, or is that just blue on top of the brown table? I can't tell from the picture… I am definitely going to have to try this out! Questions on the contact paper. Do you peel it off at the end of every year? If so, does it come off easily and does it leave behind a residue? What I would give for tables!! Teaching kinder with desks is so hard – they never fit together right into groups and even on their lowest setting they are still too high for my babies' arms at the beginning of the year. We don't have much in the way of supplies so that wouldn't be a problem for me. In fact, my kids' desks are usually empty except for a pencil box and their journals. Though I am excited about trying the contact paper this next year. Can't wait to see what others do. Mrs. Trelz, I do peel it off (actually the kids love to on the last day). It does leave a little stickiness but, since I usually cover them again in August, I don't mind. This year, I might have to use GooGone, especially if I'm switching to tables and giving these desks up. I love this site! I'm not linking due to not having any pictures and my site isn't completely going yet. I taught 4th and 5th grade and had double desk. Loved them cause you could make a lot of arrangements. Then I moved to 6th grade and we had those metal desk with the basket underneath for books. I didn't like those desk when I was in middle school and High School, so I knew I was going to have to change them. After three years I put together some money and I went bargain hunting and found 6 foot tables for $20.00. I think had to find chairs. So still bargain shopping I found 4 legged restaurant chairs. They aren't ideal, but they work. I plan to find some contact paper in different colors and cover the chairs and tables. I really think that this will help with the separation of groups and table points that I plan to start next year. I love my tables! Thank you again for all the ideas and the wonderful site. Your followers also rock! I have a co-worker who covered her tables with 1 sheet of shower board (white board) and then duct taped it on the table so she could have instant white boards for the kids. I wonder if we used zip ties or velcro ties to hold desks together, would this shower board idea work to group desks together and create a table format but with desks? I have a shower board/white board post on my blog if anyone is interested in more info. Love reading these ideas- thank you!! 1. Your site is AMAZING and inspiring to me. I hope things are settling down for summer because I would love to get my blog "ladybugged" for the upcoming school year. 2. My brain is going a mile a minute with ideas off your sites for next year. Wow! That's about all I can say…Wow! 3. 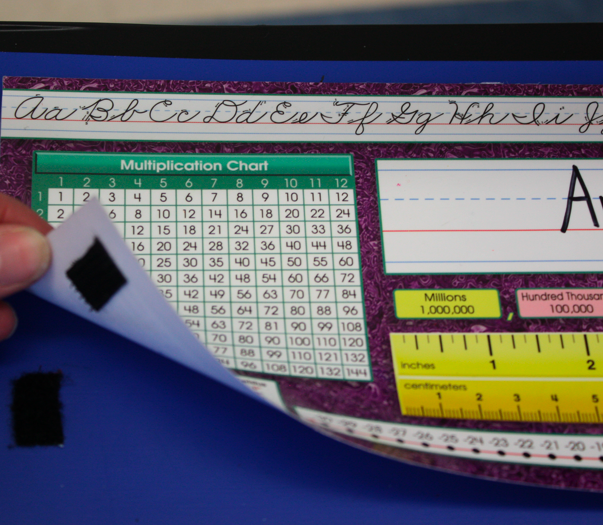 And here is the biggie – do your students pick at or peel the contact paper and/or tape? I love, love, love the look of the desks and tables. New, eye catching, and clean. I just need to know the side effects before diving into this project. Wow Karen, thanks so much for the sweet words. I am settling in, we finished up on Thursday so it's nice to be out. As for the contact paper…we model a lot at the beginning of the year. But really, I usually don't have too much of a problem because the kids like the paper and (overall) appreciate it. Thanks for reading and thanks again for the kind words! Hello all! This is my first time on this blog, and it's amazing. After being a computer specialist for the last three years, I am returning to teach second grade this school year and I have tables, which is new for me. So, I'm loving the ideas on here! I do have chair pockets for my students to use. I also have the Book Holders from Really Good Stuff that they will keep at the table during our language arts block and then can be kept on a book shelf the rest of the day. As far as nametags are concerned, I've been making them for teachers in my district for the last three years. For those teachers with tables, we measured the tops of pencil boxes, and laminate and tape the name tags to the top of the pencil box. Then the pencil boxes sit on the table. It seems to work well! I'd like to know more about your student desk basket system. Do you have pictures of the baskets and how you sort materials?